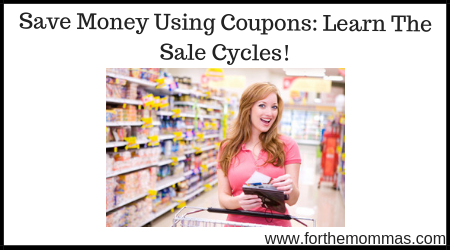 If you have been following our recent beginners series, then you are up to the fifth article to help you save money using coupons. Now that you have grown your coupon collection, learned your store policies & created an organization method, now you are going to learn the sale cycles. Having a general idea of the cycle of when items goes on sale, can also help us save money as well. Things go on sale in cycles. After a few weeks, you will start to see these cycles. Typically everything goes on sale in 6-10 week cycles. The key is to figure out how much you need of one item to last an entire sales cycle. So if cereal goes on sale for $0.99 every 8 weeks and use 2 box of cereal per week, you will need to buy 16 boxes of cereal to get you thru the sales cycle. Ok, so I just saw you cringe at the thought of buying 16 boxes of cereal at once. However, what if you can save $192.50 by buying 16 boxes at once instead of 2 a week. Lets say you stock up 6 times a year – that comes out to $32.00 savings per cycle and $192.00 a year.